Whenever the need to fondle something long and wrinkly grew too much to bear – which, after the death of her beloved Albert, was at least twice a week – lucky old Queen Victoria seldom found herself frustrated in the way of ordinary women, for one of the perks of being Empress Of All The Pink Bits was that one had a plentiful supply of pachyderms, gifts from foreign potentates to whom such beasts were, frankly, little more than garden pests. But the exchange of exotic fauna had been a standard part of diplomatic etiquette since long before Victoria’s day: English kings would receive from distant princes cages packed with pumas, pangolins and peccaries, and in return shyly proffer a gift-wrapped stoat, badger or Old English sheepdog. Or New English sheepdog, as they were known at the time. Indeed, the first elephant stomped through London as long ago as 1255, a present from Louis IX to Henry III. (Elephants not being native to France, rumours abounded that Louis had himself been given it the previous Christmas, and put it away in a cupboard; this would certainly explain Henry’s well-documented complaint that it smelt of cheap aftershave.) Sometimes, of course, one of a sovereign’s less nubile daughters would be traded instead, but that’s just politics, and needn’t concern us here; instances of royal offspring being forced to marry elephants for reasons of political expediency are generally apocryphal and, although apparent evidence of elephantine input to the bloodline does occasionally surface, it’s usually quickly discredited or, if that’s not possible, locked in an attic. In the winter of 1623, an elephant arrived from Spain with strict instructions that, to ward off the cold, it should be given wine to drink, not water. Despite only a few short (but happy) months passing before poor sozzled Nellie packed her trunk and said goodbye to the circus, as it were, the belief that elephants needed their daily vat of claret persisted until the 18th century, when the Enlightenment happened and everyone became enlightened. That, though, was too late for many; an elephantine drinking culture had been established and, by Victorian times, many parts of London were awash with dipso jumbos. Particularly notorious was Camden Town, which had become almost an elephant ghetto after the 1831 removal of the royal menagerie from the Tower of London to the new zoo in Regent’s Park. 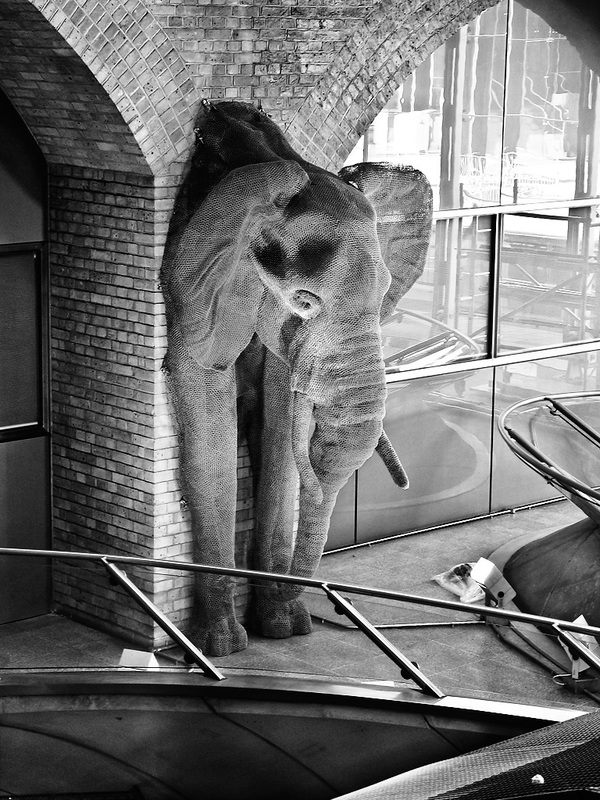 In the 1850s, the Camden Brewery cynically began brewing Elephant Pale Ale in its Hawley Crescent premises (present day “Elephant House” marks the spot), specifically aimed at the local proboscidean populace, and soon the sight of destitute elephants slumped in the side streets off Parkway, or curled up in railway arches with their trunks wrapped round a bottle of cheap burgundy, was all too common. Not that you’d ever know it from contemporary social commentators, who mostly joined Gladstone in trying to sweep homeless elephants under the carpet (generally on Tuesday evenings, weather and brushes permitting). Even Charles Booth’s famous Descriptive Map of London Poverty (1889), colour-coding the city on a street-by-street basis from red for the nobs through blue for the poor to devilish black for the “street-sellers, loafers and semi-criminal”, kept mum. Early drafts of the map had apparently had vast swathes west of Kentish Town Road tinted pearly grey (“sub-continental, ex-circus and occasional hippos”), but Booth was instructed by the Home Office to burn them. The only way out for a down-and-out Dumbo, it seemed, was the big top, and even then life was hard. Beneath a roundabout in Ealing, for instance, lies the body of one top-hat-tossing tusker who, on his way from Greenford to a matinee on Ealing Common, sounded one last mournful trump and then keeled over, halfway down Castlebar Road. Pragmatism being the better part of honour, his keeper simply rolled him over and buried him where he fell. The subsequent gyratory traffic flow was almost inevitable. Surprisingly, World War II brought some upturn in elephantine fortunes. 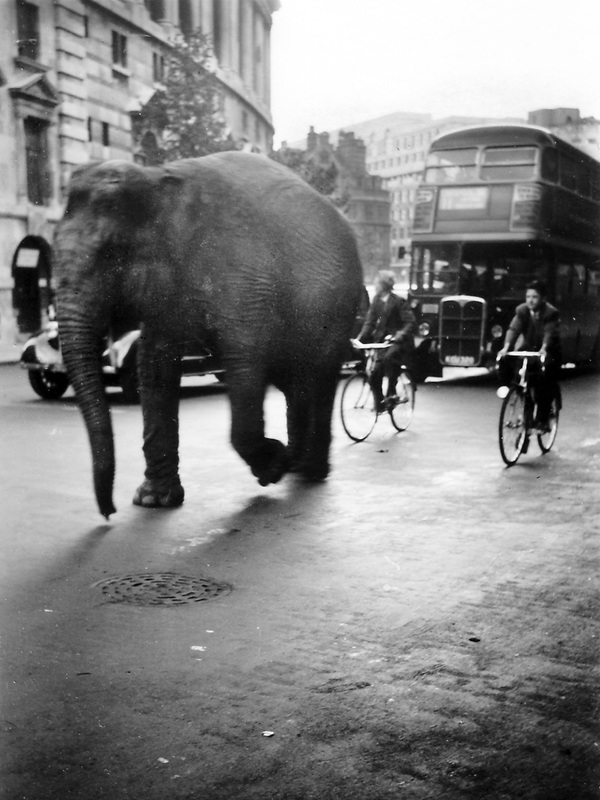 With double-deckers having been commandeered for the movement of troops, London Transport began using elephants to fill gaps in the service. At the top of this page, for example, we see a Number 23 elephant just leaving Aldwych. The indifference of the two cyclists shows just what a common sight this was on our capital’s streets, and passengers, though at first nervous, were soon won over when told that fares could be paid in buns. Especially once buns came off the ration. By the Sixties, attitudes to animal welfare were changing, and eventually even London Zoo no longer boasted an elephant amongst its magical collection of weasels, otters, and smallish monkeys. Folk memories are more obdurate, though, and sculpted tributes to the noble beast abound. A few years ago, for instance, this wire mesh elephant’s head appeared just above the Jubilee Line escalators in Waterloo station, bathed in orange light: paid for by former employees of the London & South Western Railway, it commemorates Ernie, a towering African bull who, when so many of the company’s employees had gone off to war, worked an uncomplaining ten-hour shift, five days a week, pulling commuter services on the Hounslow loop.